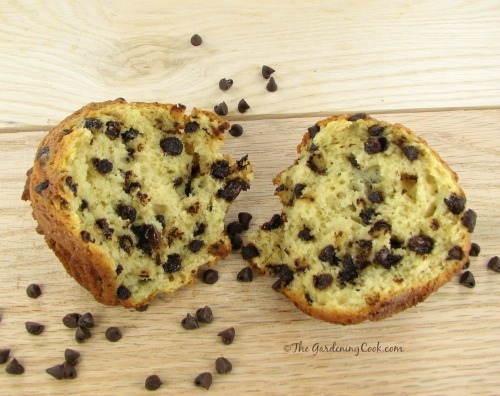 Bakery style muffins are certainly not designed for those on a diet. Those babies are enormous. This recipe for jumbo chocolate muffins gives you the indulgence of those big muffins without the price tag that goes along with them. They make a great breakfast on the go. 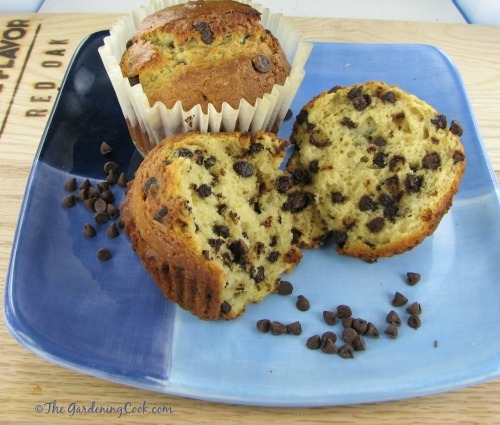 The jumbo chocolate chip muffins are easy to make. The only part of this breakfast recipe that is a bit tricky is how full to make the muffin cups and how long to cook. Most cookbooks tell you to fill muffin cups 3/4 full but if you want the look of the bakery muffin, you will need to fill them almost full, to get that tall top to the muffin. The muffins are really delicious. Moist and full of flavor. And BIG! Cook them for 25 to 30 minutes. Mine took about 29 to get the texture right but it depends on your oven. They should spring back slightly and a toothpick inserted in the center will come out clean. ** Cooking Tip:** To make sure that the muffins don’t cling too much to paper liners, spray the inside of them with Pam cooking spray before filling. 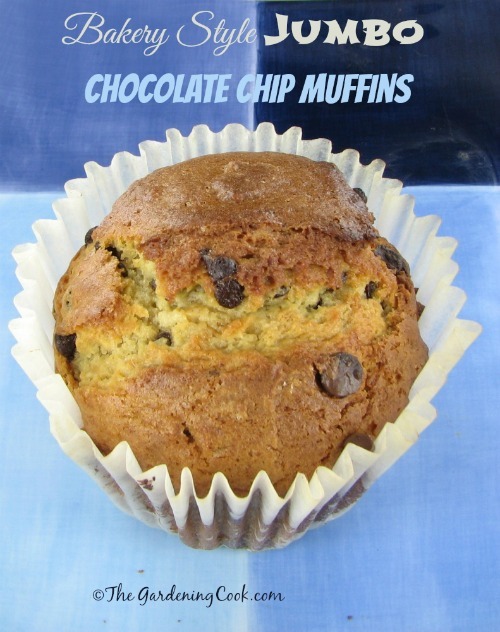 It works well, so that you can peel the paper cup off without having a lot of muffin sticking to it. Preheat the oven to 400 º F.
In the bowl of your stand mixer, mix the eggs, oil, milk, sugar and vanilla extract together on medium speed. If the mix is too dry, you can add just a tiny bit more oil or milk. In a separate bowl, mix the flour, baking powder, and salt together. Gradually add the dry ingredients to the wet ones. Mix just until combined. The batter should be slightly lumpy. Fold in the chocolate chips being sure they are mixed well. Bake at 400º F for 25-30 minutes. Enjoy!